The Phillies were expected to be an improved team this year, but its doubtful anyone had the club sitting 11 games over the .500 mark at the All-Star break while also in sole possession of first place in the NL East. The Phillies enter play on Friday a half-game ahead of Atlanta in the division and 5 1/2 in front of Washington. Bearing a catastrophic losing streak that sinks their chances, the Phillies are in legitimate contention for the divisional crown, or at the very least a wild-card berth. Here are four key storylines to follow as the second half of the season gets underway. The Phillies didn't land Manny Machado, but other options are out there on the market that can improve the club, and their price is significantly lower. Third baseman Mike Moustakas of Kansas City is one name that's surfaced a lot as of late, but his career offensive output (.251/.305/.430) is nearly identical to Maikel Franco (.251/.303/.431), and he's having a down year at the plate in his final season before hitting free agency. He has postseason experience and is a veteran, but his output may not differ much from Franco's. Eduardo Escobar could be an intriguing fit. The 29-year-old infielder has spent the past seven seasons in Minnesota and is perhaps the most versatile player to be rumored on the trade market. He can play shortstop, second base, or third base, plus his bat would be a welcome addition to the lineup with a 124 OPS+ coupled with 14 homers and 57 RBIs. As for on the mound, former Phillie Cole Hamels and reliever Zach Britton appear to be the two hurlers most closely linked to Philadelphia. Hamels, 34, has a career-high 4.36 ERA this year over 19 starts with Texas. He's surrendered 21 homers though already this year and has a 5.05 FIP. A sentimental favorite in Philly, perhaps a change of scenery would be good. It's worth mentioning that Hamels is owed $20 million next year with a $6 million buy out. Britton is one of the top relievers available on the market, having collected 120 saves between 2014 and 2016 before missing a chunk of last year due to injury. He's struggled at times this year in Baltimore (4.31 FIP) but has a track record that makes him a viable option for the Phillies. He's also due to be a free agent at the end of this season. The Phillies enter the second half ranked 12th in the National League in team batting average (.236) and 11th in OPS (.709) and runs scored (411). It's not an overstatement to say these figures have to improve to ensure sustainable success. The Phillies are carrying a 0.2 advantage in run differential per game, 7th best in the National League. The club also has a luck factor of +4, meaning all things equal and via the Pythagorean Theorem, their run differential should have resulted in a 49-46 record at the All-Star break and not 53-42. Carlos Santana, Scott Kingery, and Nick Williams are all candidates to break out in the second half, and that'll likely have to happen if the club wants to remain a frontrunner in the NL East. The Phillies' starting rotation enters the second half with a 3.72 ERA, good for 6th best in all of baseball. 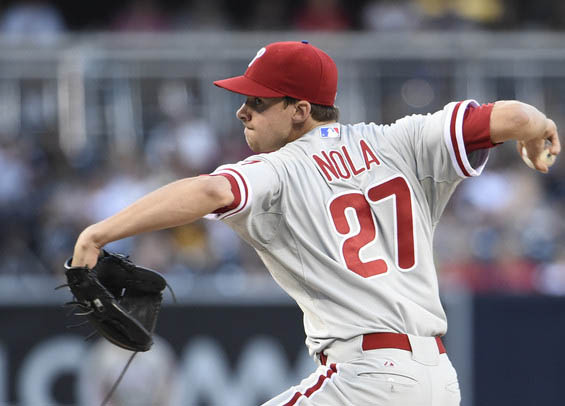 All-Star Aaron Nola played a major role in the staff's early success, but so did Zach Eflin who entered the year as little more than a back-end starter with a short leash. His 3.13 ERA ranks 23rd best in baseball, and he's surrendering less than a homer per nine innings to go along with an outstanding 1.08 WHIP. Assuming Nola and Jake Arrieta remain a dominant duo, it'll be essential for Eflin to anchor the backend of the rotation. Adding in another veteran arm though via trade, like a Hamels or J.A. Happ, could also limit any potential fall off that could happen in the second half from either Eflin, Nick Pivetta, or Vince Velasquez. 4. When Will Fans Come Out? It's strange to say, but Philadelphia has become a city of champions. The Eagles with the Super Bowl and Villanova basketball and their pair of national titles mean the sports landscape in Philadelphia is as competitive as ever. The Phillies rank 19th in all of baseball when it comes in fan attendance through the All-Star break, averaging 26,739 per game at Citizens Bank Park. The only NL teams with worse attendance figures are Pittsburgh, Cincinnati, and Miami. The Phillies are the youngest team in baseball and have a potential Cy Young candidate in Nola, a Manager of the Year candidate in Gabe Kapler, and a handful of young talented players that make up a talented core. Is it the lack of a known superstar? Is it the lack of a track record from any of the younger players? Maybe it's because the club wasn't supposed to be this good this fast. Either way, there's a lull in the interest of the Phillies right now, and it'll be interesting to see what draws fans back out to Citizens Bank Park.